Review: Imagine traveling across the world. You just got off the plane to explore a new country, and then you realize your journal has been switched. This is where you then suddenly find yourself stuck in Minneapolis, Minnesota at Phinn's Bed and Breakfast. The boy who switched the journals intrigues you; you end up staying in Minneapolis longer than intended. You start to wonder what will happen next in Minneapolis, and then find it will become a wild journey. 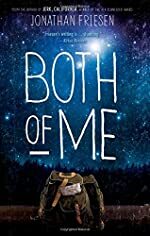 In Both of Me by Jonathan Friesen, readers will be able to embark on that wild journey. While in Minneapolis, Clara, meets Elias she has some fun with him, but then they meet ÒThe Other One.Ó Clara and Elias go throughout the U.S. to help ÒThe Other OneÓ find what he needs for the Queen of Salem. Salem is Elias's second world in a sense and the queen is Clara's deceased mother. Clara thinks that ÒThe Other OneÓ knows about what she has done in the past. So to figure out what she wants to know, her and Elias go through Wisconsin, Chicago, Ohio, and New York. While traveling they experience some wild things that don't happen to regular teenager. Along the way she finds that she starts to get feelings for someone. She vows never to do that while traveling around the world. The ending of the book is shocking and unexpected, definitely worth reading. This book is intended for ages 12+, because it deals with a lot of issues. The main characters in the book are Clara, and Elias. Together they and the others at the inn explore Salem, Elias's alternate world, and everybody is trying to figure out how Salem works and how long everyone can keep Elias in Salem. The main conflict in the story relates to ÒThe Other One,Ó as she calls Elias's second personality, and what he really knows about her. Although some parts are slower, it is overall a good book.